Primitive Rustic Country Western Cowboy Horse Sampler Hand Painted Tissue Box Cover. 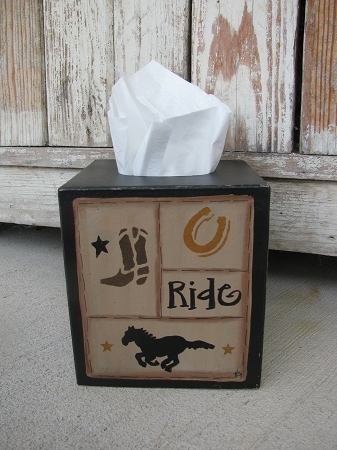 Country Western Primitive Sampler Style Tissue Box Cover. Made of paper mache, that's hand painted and sealed. Covers boutique style tissue boxes. 5"x5". Thanks to my friend for asking me to paint this for her Mom, we now have a western themed tissue. Great gift for the Horse lover on your list as well. I've painted a black horse silhouette, with a horseshoe at the top, the word RIDE and a cowboy boot with star. Side color options as well, shown with black. Hand painted, designed and signed by Heidi.